IG is one of the leading online brokerage firms and a subsidiary of public company IG Group Plc. Since 1974, IG has been offering innovative products to the retail trading community. The London-based firm is a leader in offering Contracts for Difference (CFDs) on a wide variety of assets including forex, indices, shares, commodities, cryptocurrencies, options, interest rates, bonds and more. CFDs are derivative securities that allow customers to gain exposure to the price of financial instruments without actually holding the instruments in their accounts. Traders looking for an established provider of forex and CFDs trading with a 40-year track record and a worldwide presence may want to investigate IG. Please remember that trading CFDs exposes traders to the possibility of losses. This IG review will give readers a thorough overview of the broker’s services and discuss its major strengths and weaknesses. What's Good About IG Index? What Could IG Index Do Better? Customer Support Email, live chat, Twitter and phone support from 8 AM Saturday to 10 PM Friday. Stuart Wheeler founded IG Index in 1974 in response to the collapse of the Bretton Woods agreement and the free floating of currencies. The firm, which started with three employees, began by offering spread betting on gold, but soon expanded to other commodities and currencies. IG has introduced numerous innovations in the brokerage industry since its founding. In 1998, IG established the first online dealing platform for spread betting, and in 2015, the broker developed the first trading app for Apple Watch. 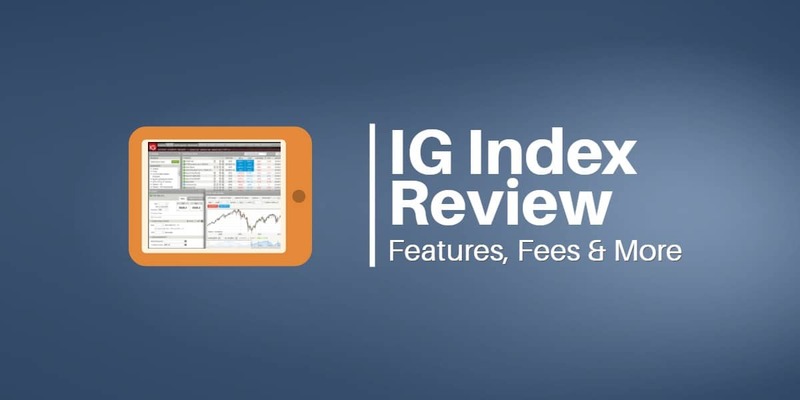 In 2017, IG delivered a new customizable platform designed to appeal to both new and experienced traders. IG opened its first overseas office in Melbourne, Australia, in 2002 and launched a Swiss bank in Geneva in 2014 and in Zurich in 2018. The broker opened a Dubai (UAE) office in 2015 and recently obtained a license to open a Shanghai, China, office. 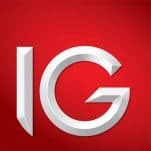 IG Group has its headquarters in the City Of London, United Kingdom and sales offices in 13 other countries. The company serves over 195,000 clients worldwide in over 150 markets. The Financial Conduct Authority (FCA) in the United Kingdom: Both IG Markets Ltd (Register number 195355) and IG Index Ltd (Register number 114059) are authorized and regulated by the Financial Conduct Authority. The MiFID Directive provides a passport, which allows IG to operate throughout the European Union. IG is authorized and regulated by the Australian Securities and Investments Commission (ASIC) and holds an Australian Financial Services (“AFS”) license (Number 220440). IG Asia Pte Ltd (Co. Reg. No. 200510021K) holds a capital markets services license from the Monetary Authority of Singapore (MAS) for dealing in securities and leveraged foreign exchange trading and is an exempt financial adviser. It is also licensed by International Enterprise Singapore to trade CFDs on commodities. IG Markets Limited holds a Financial Service Providers Register (“FSPR”) derivatives license in New Zealand (FSP No. 18923). IG US LLC has an FX US License from the NFA. IG offers customer support 24 hours a day from 8 AM Saturday to 10 PM Friday. Customers can contact the company in multiple languages by toll-free phone, email, Twitter or live chat. The website is available in English, Chinese, French, German, Italian, Japanese, Portuguese, Russian, Spanish and Swedish. IG offers different products for trading in different countries, so traders should check with customer service when opening an account to confirm what products are available in their country. Important: Traders in the United States cannot trade CFDs or spread bet via IG, but can trade through NADEX, a US subsidiary of IG Group. Languages: English, Chinese, French, German, Italian, Japanese, Portuguese, Russian, Spanish and Swedish. IG offers a safe and regulated environment for trading financial instruments. The company has been in business for over 40 years. As a global operator, IG receives regulatory oversight from many agencies. Each company within the IG Group is subject to regulation by the appropriate bodies in the territory where it operates. IG also must adhere to regulation and legislation relating to technology, the provision of internet services and use of the internet. The Financial Conduct Authority (FCA) regulates the firm in the UK, while the Markets in Financial Directive (MiFID) allows the company to operate as a regulated entity throughout the European Union. The firm’s Australian operations fall under the regulatory auspices of the Australian Securities and Investment Commission (ASIC). In addition, IG is regulated and authorized to operate in Singapore by the Monetary Authority of Singapore (MAS) and in New Zealand under a license by the Financial Service Providers Register (FSPR). Financial Services Compensation Scheme (FSCS) may cover up to £50,000 if IG Index fails. The UK’s Financial Conduct Agency (FCA) regulates IG activities in the UK. The FCA is widely respected as a leader in financial regulation. In addition, the UK scores highly in Transparency International‘s rankings of countries based on their corruption perceptions index meaning the UK is a pillar of anti-corruption. IG customers in the UK are protected by the UK based scheme Financial Services Compensation Scheme (FSCS), which was established to protect consumers when authorized financial services firms fail. FSCS pays compensation up to £50k to customers in the UK if IG is unable to pay. IG Markets Ltd hold register number 195355, and IG Index Ltd holds Register number 114059. The Australian Securities and Investments Commission (ASIC) covers IG's activities in Australia, New Zealand and South Africa. ASIC’s oversight of IG means that client money is held in a trust and completely separate from the firm’s own money. Unlike other jurisdictions, however, if you are based in Australia or South Africa, there is no additional compensation scheme in place to cover your deposit. That doesn’t mean it isn’t safe to deposit with IG if you’re in Australia or South Africa. Rather, you are offered only the legal protection afforded by the Australian legal system. That being said, money held in trust in Australia is highly regulated and covered by the Corporations Act. IG Australian Financial Services License reference number is 220440. The Monetary Authority of Singapore (MAS) authorizes and regulates IG in Singapore. IG ensures that all customer funds on deposit with the firm are held in segregated trust accounts with banks licensed in Singapore under the Singapore Banking Act. IG operates in accordance with the segregation requirements under the Singapore's Securities & Futures Act (SFA). The firm does not use client money to hedge its positions or to meet the trading obligations of other customers. The IG registration number with MAS is 200510021K. IG has similar regulatory oversight in the other regions where it operates. The firm has been in business since 1974 and has a reputation as a professional trading firm. 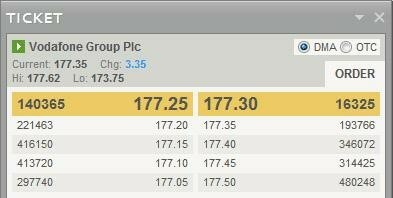 Shares of IG's parent company, IG Group plc, are publicly traded on the London Stock Exchange. As a public company, IG Group must make full disclosures about its financial health. IG Group plc, the company that owns IG, is a publicly held company. The board of directors consists of six non-executive board members and two executive members. Two key executives help manage the operations of the brokerage firm. 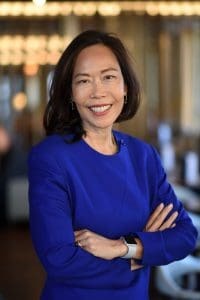 Chief Executive Officer June Felix is IG's first female CEO, the former Citibank and IBM executive will lead the online financial trading firm as it navigates the sector’s tightening regulatory environment. 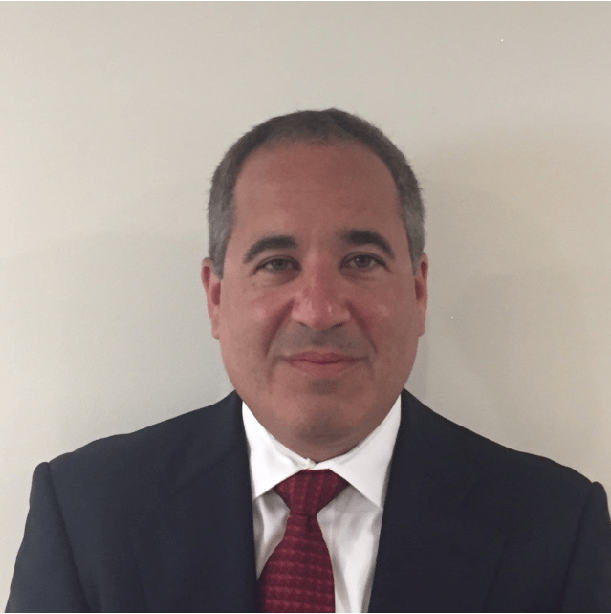 Chief Financial Officer Paul is responsible for helping build and grow the operational and strategic part of IG’s business. 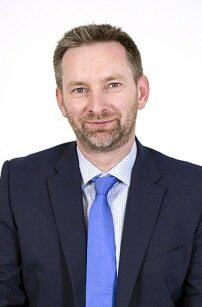 He joined IG from Tullett Prebon plc where he served as Finance Director from 2006 to 2016. 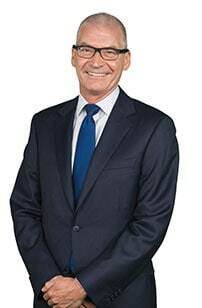 He previously served as Group Finance Director of Mowlem plc and TDG plc. He earned an MBA from Cranfield School of Management in 1991. Chief Information Officer In 2012, Jon was appointed Chief Information Officer at IG. He is responsible for the IT strategy of the group and for ensuring the technology's security and stability. Jon has been with IG throughout his entire career, which began in 2000 when he was a graduate trainee. In 2010, he became Dealing and Operations Director. He holds an Executive MBA from London Business School. Chief Commercial Officer Bridget was appointed as Chief Commercial Officer in September 2015. She is responsible for the strategy of the group, for developing and managing IG's relationships and for attracting prospects to IG. 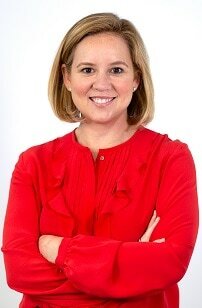 She first joined the group as Legal Counsel in 2005 and has undertaken a number of roles during her career. Prior to this, Bridget worked at Deutsche Bank as a lawyer for their trading desk. She is a qualified lawyer, holding an LLB (1st Class Hons) and BBus (Dean's List) from Queensland University of Technology. IG offers customers CFD trading in dozens of different categories of products in over 150,000 markets. Customers can trade more than 8,000 international shares CFDs. Traders receive the dividends for share CFDs that are long. In addition, traders have the ability to short shares in many cases. Popular categories include UK, US and Eurozone shares. Options – Traders can buy or sell CFDs on options on indices, commodities and currencies. Sectors – Traders can speculate on strength or weakness in a particular sector. IG offers 35 UK and Australian sectors including banking, mining and retailing. Cryptocurrencies – Traders can buy and sell CFDs on bitcoin, ethereum, ripple and litecoin. 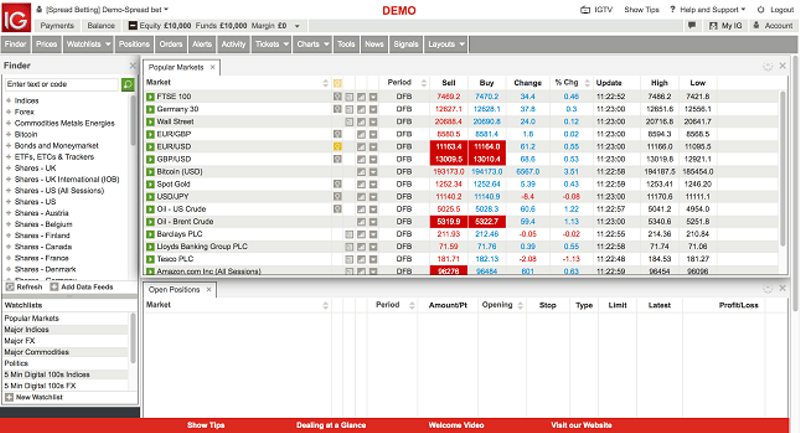 In addition to CFDs, IG also offers spread betting on a variety of products. Spread betting is similar to CFDs, but instead of a standard contract size, traders can choose the amount they wager for each incremental move in the underlying. Spread betting is tax-free to UK residents. IG customers choose an account based on the type of instruments they intend to trade. Traders can open a CFD trading account, spread betting account or share dealing account. A share dealing account allows traders to buy and sell the actual shares of companies without using CFDs. Traders who want to trade all of these instruments can open an account that combines all three. Traders can buy and sell thousands of global shares and ETFs. Traders can open a live account with a deposit of $200 and have leverage of from 30:1 to 2:1 (these vary depending on the volatility of the underlying instrument, e.g. cryptocurrencies are 2:1 while major currency pairs are 30:1). All traders can also open a free demo account to enter practice trades. Demo accounts begin with £10,000 in virtual funds and allow traders to test strategies both on a desktop platform and with free IG mobile apps. IG traders pay a spread on every spread bet or non-share CFD. Traders pay commissions on every share CFD and also on share trades. The minimum spreads and margin rates for some of the most popular products are detailed below. The spreads for many products depend on the time of day of the trade is placed. Traders should consult the IG website for specific details. Deposit Fees: European debit cards incur no fees, but credit card, PayPal and non-European debit card transfers incur a 1.5% transfer fee. PayPal funding also incurs a 1.5% transfer fee. Withdrawal Fees: IG does not charge withdrawal fees in most cases; however, customers that want to receive same day payment using a CHAPS bank transfer incur a £15 fee. Back to Base/Currency Conversion Charge: IG charges commercially reasonable rates for converting CFD and forex trades back to your base currency. Overnight Financing Charges: This overnight fee (or credit) is either added to or subtracted from a trader’s account when a position remains open past a certain period of time. Traders can obtain information on overnight funding rates at the Fees and Charges section of the IG website. Live Feeds Obtaining live share prices from an exchange, whether that's to trade share CFDs or buy and sell shares via a share dealing account incurs a monthly fee. Account Documentation Fee £50 for accounts that have not supplied a mandatory W-8 or W-9 form prior to ex-dividend date on a US-incorporated stock. Only applies to accounts entering into these trades. During the account opening process, traders can choose whether they want a CFD account, a spread betting account or a share account. IG doesn’t require specific prior trading criteria to open an account. However, traders must answer some questions to demonstrate that they understand the trading products and the risks associated with them. IG margin requirement allows traders to trade on margin of up to 1:30 on some products. However, traders who use excessive leverage on trades risk getting margin calls and having their positions prematurely closed. IG notifies traders when they fall below the IG margin requirements. Traders whose equity falls below 99% of the required margin receive an email notification. Traders receive a second email when equity falls below 75% of the IG margin requirements. IG will start automatically closing a trader’s position if the equity falls below 50% of the required margin. The minimum withdrawal amount on an IG account is £100 or the available account balance, whichever is lower. Withdrawals are free of charge unless you require a CHAPS payment, in which case there is a £15 charge. For compliance purposes, IG must transfer your funds back to the original source you used to fund your account. This account needs to be in the same name as the account maintained with IG. Generally, bank withdrawals should arrive within 24 hours. If you request a withdrawal before midday, funds should be with you on the afternoon of the day you withdrew between 2 pm and 6 pm (UK time). If you’re refunding funds to your card, it’ll take your card issuer 2-5 working days to credit these back to your bank account. 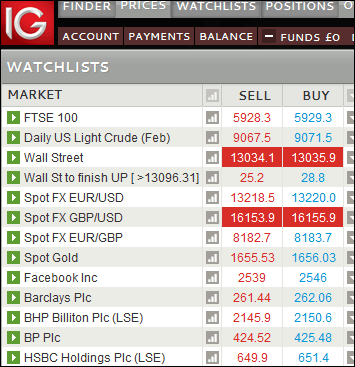 The IG platform packs a lot of information and analytical capability on to its main trading screen. The window contains several panels, which gives the page a crowded look. However, once traders familiarize themselves with the functionality on this page, the platform’s ease of use and logical design become apparent. The main page contains panels with search functions, instrument prices, trading positions, charts, trading tickets, watch lists and alerts. 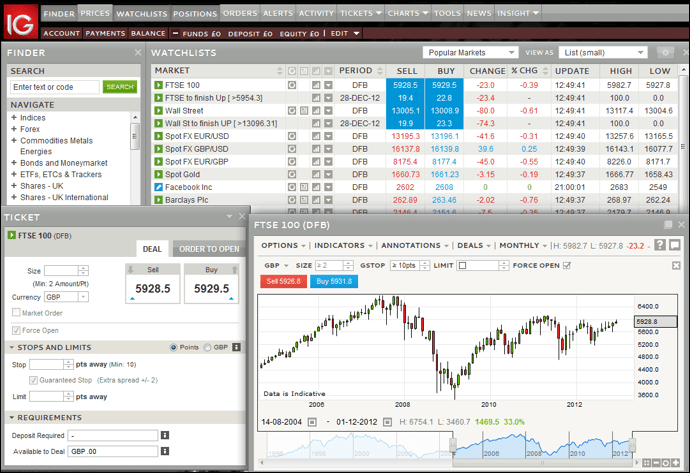 Traders can drag, drop and resize these panels to customize their trading experience. Traders can navigate through the list of instruments by clicking on the plus symbol next to each item or they can enter the name of an instrument in the text box at the top of this window. This feature is a nice benefit. Many other systems have one or the other of these ways to search, but not both. Watchlists: This section allows traders to customize multiple watchlists for tracking markets or trade ideas. 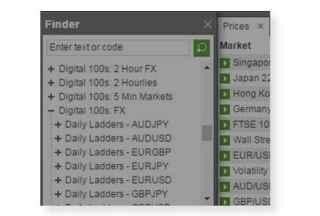 Traders can customize each list, give it a name, and keep a separate window open for it. Trade Ticket: The IG trade ticket allows traders to quickly and easily send orders into the marketplace. At the same time, the system allows more advanced traders to enter orders with various contingencies. Traders can choose whether they want to send a market or a limit order. They can also choose whether they want the order to be good till canceled (GTC) or whether they want to set a time for the order to expire. Traders can also decide what closing conditions they want placed with the order such as stop/loss contingencies. In total, traders can choose from five types of orders: limit orders, market orders, stop loss orders, trailing stop orders and guaranteed orders. Guaranteed stop orders ensure that a trader’s order will be filled at the stop price. One limiting factors with the IG trading ticket is how the system handles trailing stop orders. Traders must decide when they configure their settings whether or not they want to apply them to all of their orders. In other words, every order gets a trailing stop or no orders get one. With more volatile instruments, traders may end up taking profits on positions they would rather hold. Another problem with the IG trading ticket is its configuration with two tabs – “Deal” and “Order to open.” Traders entering market orders must use the deal tab, while limit orders need to be entered on the order to open tab. This creates unnecessary confusion that the platform designers should have avoided. The trade ticket also shows the margin required for the trade. The IG platform offers customers sophisticated order execution tools. Traders can choose to get partial fills on orders, which increase the probability of successfully executing trades. Traders can also choose a “price through current” option, which allows them to pay successively higher prices (up to a predetermined limit) to increase the chances of being filled. Traders also have the option with some securities of receiving direct market access. 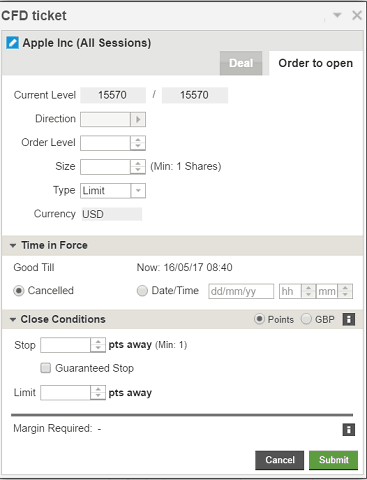 This feature enables customers to buy CFDs with pricing based on the underlying security rather than IG pricing. Traders choosing this option will tick the DMA box on the trading ticket. Charts: Traders who like technical analysis may enjoy many of the charting features of the IG platform. Traders can draw charts with a variety of different technical indicators including Bollinger bands, moving averages, pivot points and candlesticks. Traders can name these charts, save them and pull them up as needed. The charting tools have little icons next to each of the technical tools. These pictures are a great way for novice traders to see what each of the functions does before drawing a chart. One negative of the IG platform is that traders who choose multiple accounts (for example, a share and a CFD account) can only see one account at a time. This makes coordinating and hedging between these accounts more difficult. All in all, however, the IG platform is a reliable and easy-to-use tool for active traders. IG offers an extensive library of educational tools on its website. Traders can choose from videos and reading materials on topics including leverage, risk management, markets, and basic trading terminology among others. Introduction Program: This program, which is geared toward novices, allows traders to bet with reduced sizes for the first two weeks after they open an account. The program also provides traders with free educational modules on a variety of topics. Monthly Newsletter: Contains latest news and features from IG. Spread Betting – A Guide for Share Traders: This free three-part E-book is an in-depth guide to spread betting. IG Academy App: a mobile educational tool. Traders can also download a free demo account to practice trading. The demo account looks identical to the live trading account except it says Demo on the top of the page. Traders start with £10,000 in virtual funds. There are no IG bonuses and promotions for traders opening accounts. The lack of sign-up bonuses are due to new legislation that's been introduced in the EU. The Markets in Financial Instruments Directive (MiFID) has been implemented to provide traders with greater protection through a more transparent market. Therefore, any broker offering sign-up bonuses are either unregulated in the EU or aren't regulated at all, which could mean they're operating illegally. Risk Warning: Spread bets and CFDs are complex instruments and come with a high risk of losing money rapidly due to leverage. 76% of retail trader accounts lose money when trading spread bets and CFDs with this provider. You should consider whether you understand how spread bets and CFDs work, and whether you can afford to take the high risk of losing your money. Disclaimer: Commodity.com may receive compensation for this activity.